A galley kitchen can be a real challenge but with some careful moves and thoughtful design, you can create a real workhorse of a room! This darling, bungalow style home from the 1920s, had a small but efficient kitchen on the back side of the home. The kitchen appeared original but there had been some changes to the interior of the home by previous owners that had created a small dining “nook” out of leftover space. It was not quite small enough to discount entirely but definitely not big enough to entertain more than one or two guests at dinner. They had fitted it out with very nice built-in benches but wanted more space to spread out and also wanted to create better access to the backyard. The idea was to incorporate a small pass-thru bedroom which had been used as a sun-room, media room, office and storage and which had direct access to the backyard. We went through a number of design iterations and discussions that incorporated other projects they wanted to do on their home down the road. 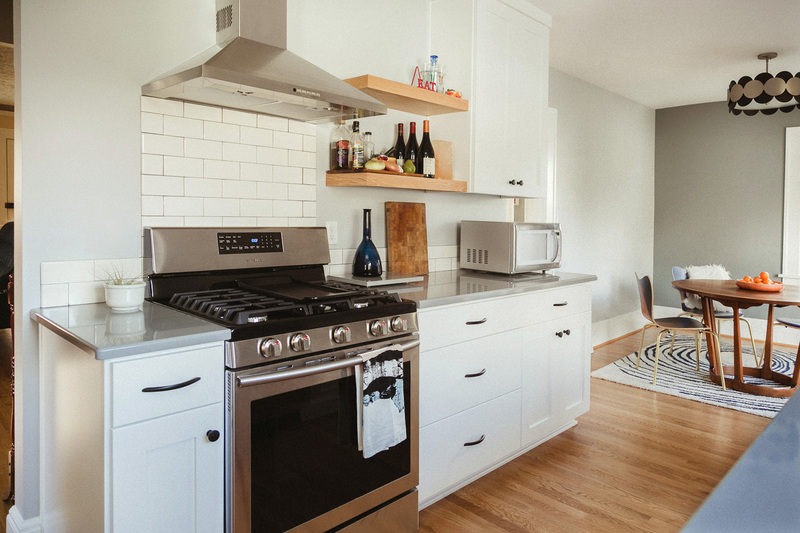 The trick with small kitchens is you really have to think them through to balance maximizing storage and prep space with keeping them open and comfortable to work in. We looked at both IKEA kitchen modules and semi-custom but chose custom in order to maximize every space. We had a fairly tight budget and made diligent use of every dollar! 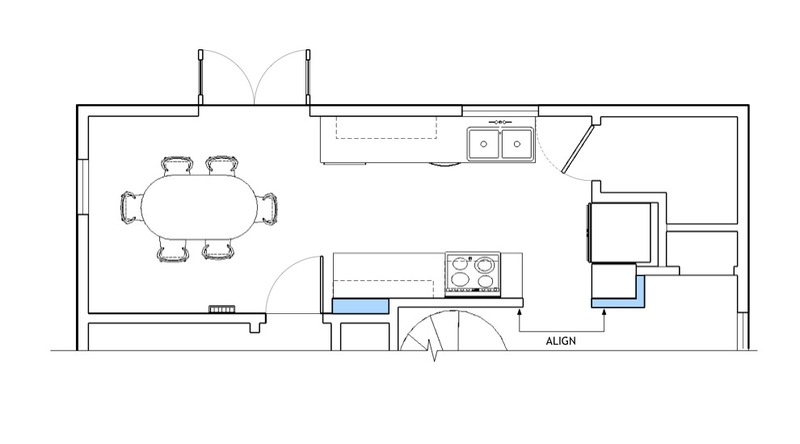 Here are a couple “before” photos and the floorplan which shows the walls to be removed (dotted and colored). The existing floorplan shows the original kitchen with a doorway off to the right that goes to stairs down to the basement. A little niche also to the right held their refrigerator. The dining nook you can see partially in the bottom right. The “sun room” was accessed from the hallway to the left and had some built-ins and a closet along the center wall. The door to the backyard was removed and that opening was widened to accommodate new french doors. The major move was, of course, to remove that dividing wall between the two spaces. 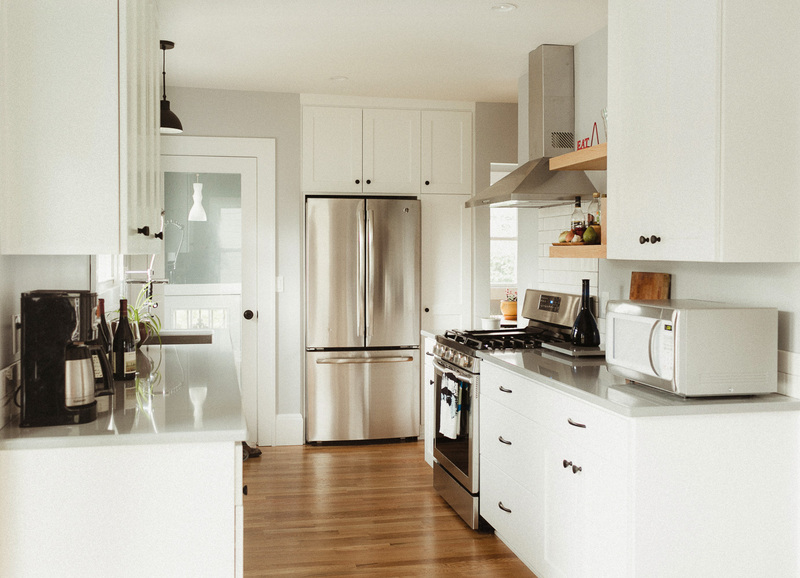 We went through several design iterations, trying the refrigerator in different locations but ultimately, both for cost and ease of completion, we kept the appliances and plumbing in their original locations. We nudged the oven over a little to get a skinny cabinet in there, and we altered the original refrigerator niche to accommodate a wider fridge and a pantry and create a nicer alignment with that entry into the kitchen. The homeowners decided to match and extend their wood flooring throughout the new space which was a definite upgrade and looks amazing. Opening that wall and putting in French doors and putting in a new glass door next to the basement steps (which has two windows in the stairway) borrows so much light into the space, it’s a real transformation. We left the sink where it was, centered under the window, but put in an undermount stainless steel sink. It was crucial to make sure we had enough room on the right for the new door to clear. We moved the oven over just a bit from where it was originally to have room for a cabinet there for trays, cutting boards and a drawer for utensils. To the right we installed floating shelves in the key prep area for easy-to-access supplies. Looking from the original “sun room” which is now the dining room, you can see the new cabinetry and pantry at the refrigerator. This move made a huge difference! The French doors bring the outside in and let in loads of light even on this particularly rainy day! You can see both windows shining in from the stairwell at the back. The homeowner found this mid-century round dining table (with leafs!) by total luck during the course of this project. It’s perfect for the space. And those chicken chairs from West Elm…I love them. So great! Amanda worked with me to massively update our Woodstock kitchen. Hiring her was by far the best decision I made. From beginning to end, Amanda made this project work. 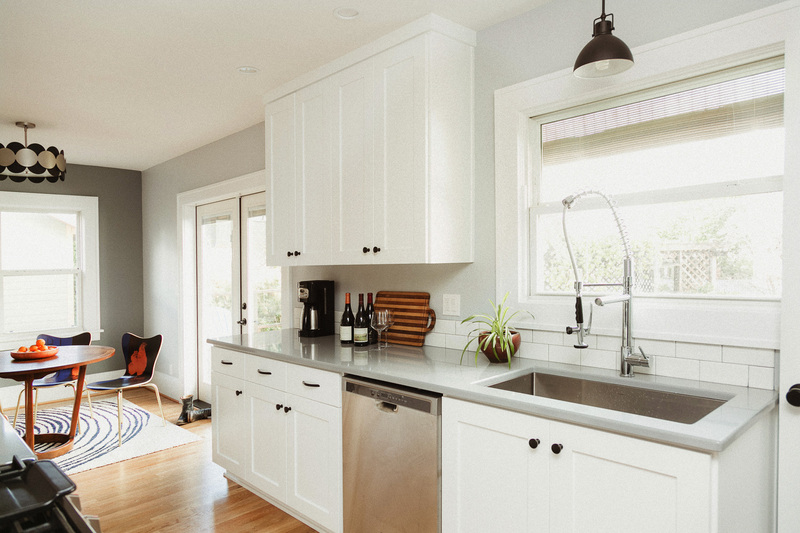 She helped us design and build our dream kitchen on a very strict budget, supplying design ideas, contractor recommendations, helpful advice for the first-time remodeler and a lot of moral support along the way. 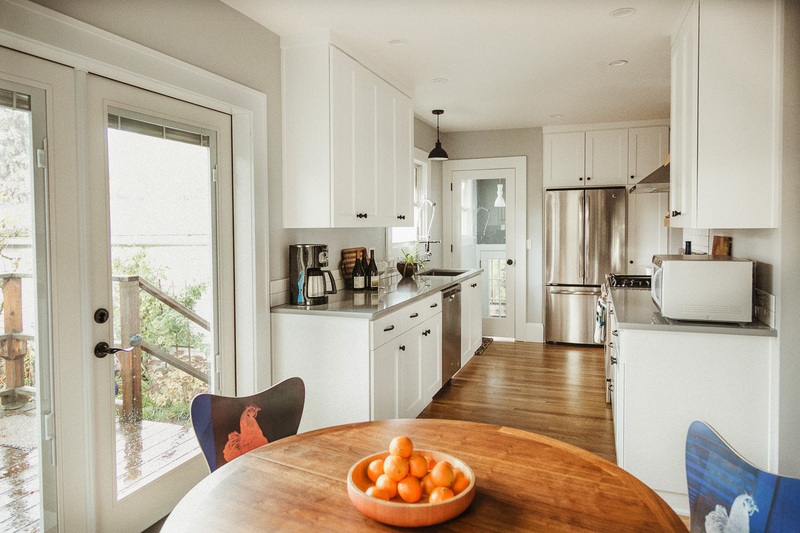 Amanda flawlessly incorporates her trained eye for great design with practical knowledge of the wild and sometimes frustrating world of home remodeling. She was always available to answer questions, suggest design detail ideas and make what sometimes seemed an overwhelming project come together better than we ever dreamed. Our kitchen is stunning and it exceeds my expectations in every way.